The Man in the Gray Cat Suit | The Reverend Dr. In my prior incarnation, I was an English teacher, serving as adjunct faculty in the English Department at a local university, where my colleagues were literary and imaginative and favored felines. As an esteemed professor, the former chair of the department, so succinctly stated: “We are cat people.” Shortly before starting in the English department, I had adopted a very young kitten, just weeks old, entirely gray except for a spray of white at his throat and chest. My colleague from the department observed that the tiny cat appeared at all times to be wearing his “bib and tucker,” an observation that instantly earned Tucker his name. Tucker responds to his name, and to the diminutive Tuck, and also to vaguely recognizable variations on his nickname, like Tuck-a-Tuck. But among my fellow English teachers, Tucker was perhaps best known as The Man in the Gray Cat Suit. A talented young poet I had known from my graduate program who taught composition and creative writing alongside me first called him that. One afternoon, when he stopped by my apartment for a visit, in a deceptively off-handed way, he began what I now understand was just the initial installment in an extended series of conversations he would have with my cat. Tucker from a young age was a vocal cat, so he would meow and growl and purr and chatter and on some rare occasions even bark. He also listened to people rather intently, cocking his head back and forth, considering their words in a measured way. After this particularly poetic prompting, he made a string of sounds that my poet friend regarded as intelligent conversation. From that moment forward, my poet friend did indeed address Tucker as the Man in the Gray Cat Suit, and something crystallized for me. It stays crystalline today. Tucker is nobody’s darling. In fact, he’s quite a difficult cat. He’s dark and brooding, a feline Byronic hero. I appreciate why poets might feel a special affinity with him. Above all, he hates having his intelligence insulted. Tucker refuses brute force or else responds to it in kind. He insists on getting his due dignity. We’ve had a number of different veterinarians in the sixteen years that Tucker and I have been together, winding our way up and down the East Coast, more than I care to count. With any new vet, I try to do advance work, preparing them for the challenges he might present. One New York vet who was originally dismissive ended up calling in the clinic’s “angry cat specialist,” to borrow his term, and after a particularly ugly incident, essentially requested that we never again return. We never did. Having Tucker has complicated my life to a degree I never fully anticipated. When I brought a second, much younger cat into the household, Tucker passed through what I am still convinced was a suicidal spell. It then took Tucker several additional years to accept that my husband was more than a temporary disruption in our living arrangements. My husband tried to speed this process along by bribing him with fried chicken and ice cream and likely succeeded in shaving off a year or two. Like my poet friend before him, my husband understood that things do not come easily to Tucker. 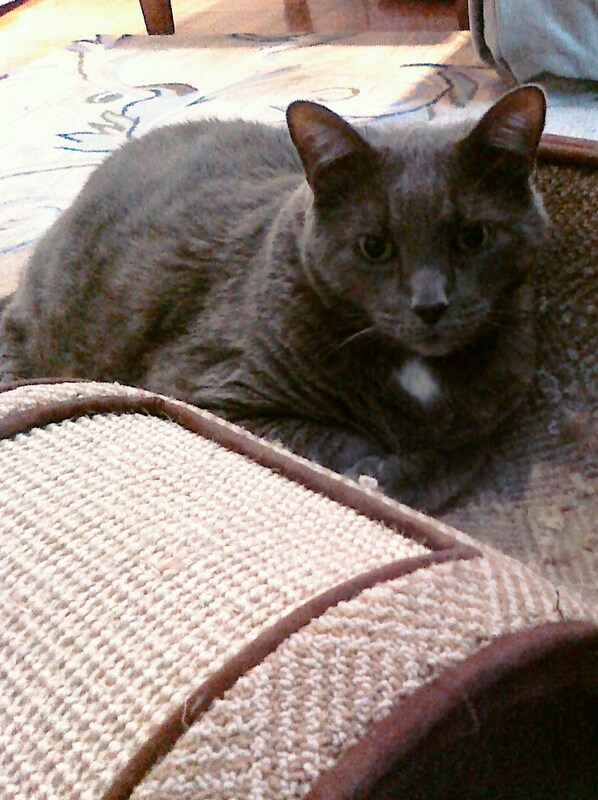 Today, when newer people come to our place to visit, I introduce Tucker by saying, “He’s a Man in a Gray Cat Suit.” He’s no longer a young man, though, so instead of seeming dark and brooding he now appears old and crotchety. His eyes are a little cloudy; he’s probably lost some visual acuity. He’s a bit dotty at times and both arthritic and diabetic. Twice a day I give Tucker insulin injections that he grudgingly tolerates — if I talk him down while I provide the shot. Attention must be paid to this Man a Gray Cat Suit. So I try to love him from a place beyond reproach, which is excellent practice for loving any of God’s creatures, great or small. What beguiles English teachers and other kinds of contemplatives about cats is (I believe) their elaborate internal life, which seems expansive enough to mirror our own in its depth and breadth. A Turkish woman of more recent acquaintance told me that the Muslims have a saying: “With other animals, the angels may not get past, but even the Prophet had cats.” Because the Prophet Mohammed had such regular interactions with angels, I had to wonder if they were on speaking terms with the cats, and if so, what they said. It strikes me as immensely worthwhile for us to have stubbornly enigmatic presences in our lives. When he was so small that he fit squarely in my palm and managed to disappear between the pillows on the sofa, I had no conception of what a major character Tucker would become in my own story, what a pivotal role he would play. But my poet friend had a better idea. I remain grateful for the glimpse that he gave me. Lo these many years later, I see that Tucker has been a key part of entire chapters in my life. In the not so distant future, in some later chapters of mine, the Man in the Gray Cat Suit will no longer have a talking part. That does not make him mere literary construct. I continue to count myself among the cat people, although I haven’t taught in an English department for more than a decade now. Because if someone were to turn back the pages of time and remove Tucker from the annals of my life, if somehow that singular strand were plucked from my history, I understand that my own narrative would become unraveled and threadbare, and I would speak a great deal less about love. This entry was posted in Interfaith Encounter, Spiritual Life and tagged Cats, Poets, Prior incarnation, The Prophet Mohammed. Bookmark the permalink.